By Azzief Khaliq in Mobile. Updated on November 18, 2017 . If you keep up with the development of custom ROMs for Android, you should be familiar with the popular ParanoidAndroid ROM, a custom ROM with many interesting features including the innovative PIE control option. PIE control gives you floating navigation buttons that appear when you swipe from the edge of the screen. But what if you want these PIE controls without having to flash ParanoidAndroid onto your device? Try LMT Launcher. Read on for a quick guide to getting ParanoidAndroid-style Pie controls using LMT Launcher. First, you need a rooted device – follow our basic introduction to rooting if you want to know how to root your device. You’ll also need to go to your device’s security settings and allow installation of apps from unknown sources. Then, head over to the official thread on XDA Forums and download the latest version of LMT Launcher. Once installed, start the app from the app drawer. Grant root access to the app and you’ll be taken to the main settings screen. 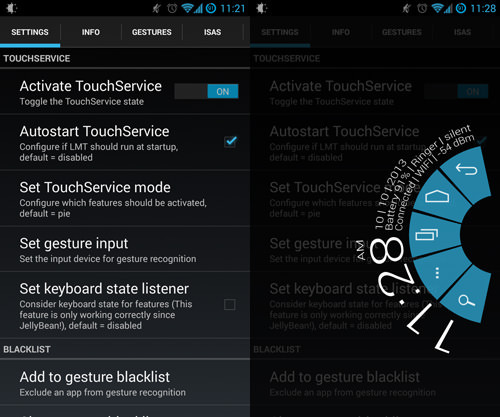 Press Activate TouchService to start LMT Launcher. You can also enable Autostart TouchService if you want LMT Launcher to start automatically when you boot your device. Now, swipe from the middle right side of your screen and you should see the Pie appear with its default settings. 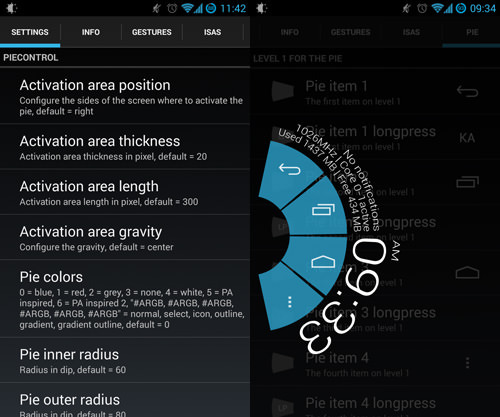 In addition to these settings, you can also customize the pie’s contents if you want. Swipe all the way to the right and you should arrive at the Pie menu. Here, you’ll be able to assign commands to each Pie item, including longpress commands (max: 10 items). You can also assign navigation commands, toggle commands and apps to the pie items, for example, you can have basic navigation controls on level 1, and shortcuts to your favourite apps on level 2. You don’t have to worry about saving your changes, since the app automatically applies every change you make. LMT Launcher also has support for Gestures and ISAS (Invisible swipe areas). Invisible swipe areas are invisible areas on screen where you can swipe to execute an action. To use Gestures and ISAS, go to the main Settings menu. Press the Set gesture input, then select your device from the list. 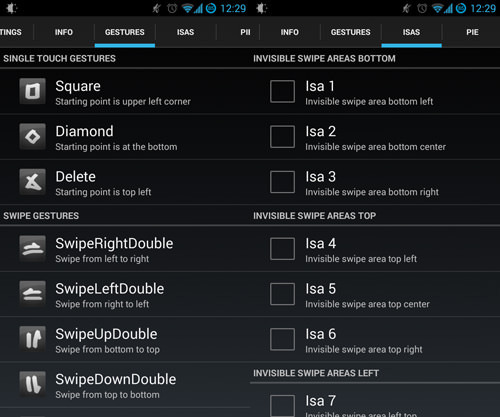 Then, press Set TouchService Mode and select either Gestures and ISAS or Gestures, ISAS and Pie. You can also tweak some basic settings for both Gestures and ISAS, but the default settings may be enough. Once that’s done, swipe to the Gestures menu, select a "gesture" and then select the "action" that should be associated with the gesture. For ISAS, swipe to the ISAS menu, select the "Invisible swipe areas" you want, and then the "actions" that you want to associate with them. On the whole, LMT Launcher’s customization options and compatibility with a wide range of Android devices mean that it’s a great way to get pie controls on your device without having to worry about changing ROMs.